NYC Educator: Working for Free--Another Charter "Innovation"
Some charter schools are looking to unionize. That's not a bad thing, and I'm certain it would benefit not only the teachers, but also the students. I'm not remotely persuaded that people living in fear of being fired for a bad haircut are the best role models with which we can provide our children. Nor do I want our children to grow up and be in jobs like those. I spoke with someone, and he articulated the core of the tensions quite well. He said, “look, if KIPP decides that teaching on a Saturday is what’s best for the kids, and that’s going to get the best result, then they should just be able do that without having to go through a teachers union and negotiate and/or pay them more to do so.” I think that’s the core of these issues, which is that you can do all these things, but should you have to actually engage with these workers to make these decisions? In other words, why should we have to pay people to work? Why can't we just tell them, "If you don't come in Saturday, don't come in Monday." Why should they have to negotiate anything? Why should working people have any voice at all? I'm pretty surprised that anyone who cared in the least for school employees would take an attitude like that, but even in charters that are unionized, it's apparently not uncommon. Now in fairness, when negotiating with management, it's your job to get as much as possible and theirs to pay as little as possible. But regardless of what you think of union contract negotiations, I wouldn't think there was an expectation of people working for free. It's very hard for me to accept that as a charter "innovation." It's not all that innovative to move labor back to the 19th century, at least not in my view. And if you happen to think of teachers unions at some point during this education policy reverie, you’ll probably have them in the role they’re traditionally assigned by the media — as anti-charter and anti-reform. Just like Israelis and Palestinians, Crips and Bloods, Yankees and Red Sox, teachers unions and the charter movement simply don’t like each other. That’s just the way it is. A powerful narrative that has developed over the past decade and a half says that the reason we have these great disparities in our education system — huge, growing gaps between the rich and poor; etc. — is in large part because of bad teachers in the classrooms and the teachers unions fighting to keep bad teachers in the classrooms. So both liberals and conservatives have seen charter schools as a way in which they can either weaken the power of teachers unions, or just bypass teachers unions altogether. It's remarkable that all the so-called bad schools full of so-called bad teachers are located in areas full of high poverty, high needs, or more likely both. By ignoring that, someone's headed for failure, and inevitably schools and teachers will be blamed. I'm a bad teacher because my students, who speak no English, get low test scores. 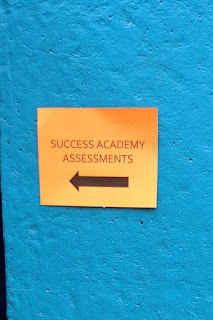 How many of my students could pass the Success Academy assessments? How many beginning ESL students do they accept? How many alternate assessment kids do they take? I'd wager zero. Therefore, there are no bad teachers like me. Let me be very direct--lack of English is not a defect to be corrected. These are children, not defective used cars, and it's our job to help and guide them. We take everyone. That is not a flaw, but rather a quality to be emulated. It's pretty easy to pick and choose kids, eliminate the ones who don't work out, and then call yourselves geniuses because you got higher test scores. Oddly, a whole lot of charters cannot even manage that. Charters are a band-aid on a gaping wound. If we really want the best for our kids, we'll help all of them, and that includes making sure they don't grow up in misery and poverty. It worked out very well in Finland. Why can't we model our system on one that works, rather than one that puts more money into the pockets of the likes of Eva Moskowitz?